Machine Quilting Magic! Meet Ramona, our in-house custom quilter extraordinaire. If ever you have made your way down to the deepest depths of the Corn Wagon and perchance made it past all the wonderful sale fabric ($5.99/yd is hard to resist!) you’ve likely noticed a sign reading, “Dungeon workers only beyond this point. All others will be dipped in chocolate and fed to the dragon.” I’ve seen many a child’s eyes widen at those words but I’m here to let you in on a little secret. While there may or may not be dragons lurking beyond, it’s definitely where the magic happens here at the shop for beyond those swinging doors our long-arm quilting machines can be found humming away, adding just the right finishing touches to your beautiful quilts. Let’s be clear, it’s not the machines that work the magic, it’s our talented free-motion quilters, Ramona Sorensen and Tammy Menlove that guide each stitch, moving the machine free-hand through custom designs. Absolute magic. If you haven’t met our quilters, I’d like to introduce you this week to Ramona and next week to Tammy. Raised just down the road in Palmyra, Utah, Ramona has now been quilting here at Corn Wagon Quilt Co. for over 14 years. She specializes in beautiful free-motion custom work and is known to unfold a quilt and let it tell her what it needs. Maybe it calls for one of her own signature edge-to-edge designs or perhaps each block demands to be treated uniquely. No matter the level of customization she has a way with quilts. Over the years Ramona has designed patterns and had nearly 30 quilts featured in publications including Fons & Porter, Quilter’s Newsletter, McCall’s, Quiltmaker and Keepsake Quilting. 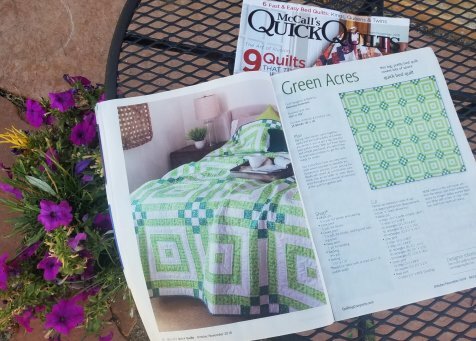 Her latest contribution can be found in McCall's Quick Quilts Oct/Nov 2018 issue coming soon to a newsstand near you! Catch a sneak peek below! Whether you know exactly how you’d like your next quilt top quilted or you haven’t the foggiest… bring it into the shop and we’ll get it down to the dungeon where Ramona can work her magic! She has hundreds of quilting thread colors at her command as well as 15 different types of batting to ensure your quilt has just the loft and feel you had in mind. Our machine quilting services start at $.015 per square inch for simple edge-to-edge quilting like stipple and loop designs and increase depending on the level of customization you request. Our employees will be happy to walk you through the details and help you consider the options. Ramona has a soul filled with color but her absolute favorite is purple. It was the perfect accent choice in her latest finish. 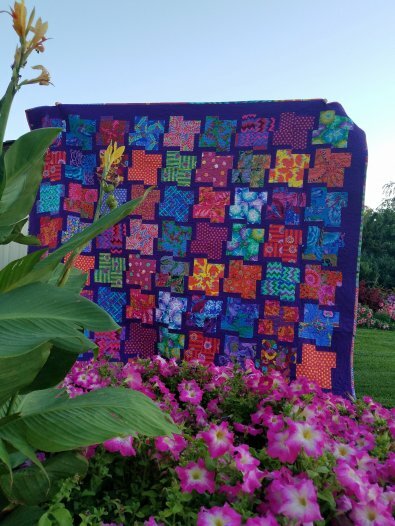 She chose a kaleidoscope of Kaffe Fassett fabrics to re-color a pattern she originally designed using Christmas reds and greens. The pattern is called Fat Quarter Spinners. It's quick, easy, looks fabulous done up in almost any fabrics and we have it here at the shop along with kits! 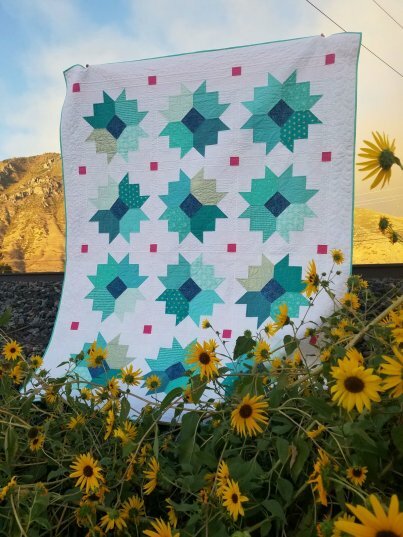 This quilt made by Julie Hancock has such a happy, hopeful feeling bursting with various shades of aqua and a tiny pop of hot pink. I thought the sunflowers appropriate since the name of this quilt pattern is Fall Flowers. Take a moment to zoom in and see just how beautifully Ramona's custom quilting accents Julie's beautiful piecing. Kits and patterns available now in-store! Sept 24th - 25% off NOTIONS AND BATTING! Thursday, September 27th 6:00 - 9:00 p.m. here at the shop! Shannon White will show you how to sew up this easy pouch pattern using a store-bought, quilted placemat as your fabric. Half the work is done before you even begin. This bag is made in just a few steps with personality and style! Add a contrasting tie or zipper charm to really make it your own. You’ll finish your pouch in class and want to make more! Sign up now online or in-store!